... an English Film, a Wednesday Play. How do you plan your layout? Track plans? Prototype research? Maps? Photographs? Well yes to all of those, but what about art? What about music? Literature? Nature? I find that all of these feed into the gestation of my modelling, especially layouts. The above line from a song, a piece of music by Sibelius, Dickens, photos and pictures (not necessarily railway related), winter walks. All currently informing and inspiring my modelling. The corner of the backscene will be infilled to provide a smooth curve between the back and the side. For those who are interested in backscene heights, and their relationship with board width etc., the backscene rises 6" above baseboard height and so only about 40-60% is visible on this board due to the hillside. The baseboard is 12" wide so that at its maximum the backscene will never be more than half as high as the board is wide. 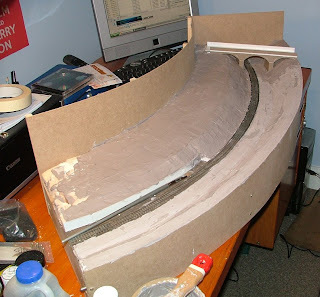 When dry, I will need to finish ballasting the trackwork. 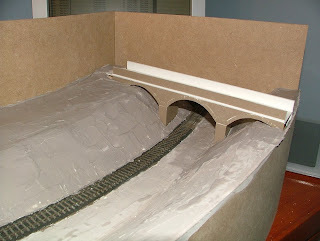 I will then probably finish the bridge by which time I ought to be in the mood to lay some more track! For those who aren't on or don't read the VAG, this rather nice link was posted recently; some very atmospheric photos to inspire you, perhaps? I intend to set my Challenge Layout - which seems to be getting called Brompton sidings - in a dull West London day, probably in autumn but definitely after a shower of rain. That should set some interesting challenges for the "weathering" of stock and scenery!